Up near the TOP of things I miss about living in Okc is going to all the Okc Thunder Games!!! 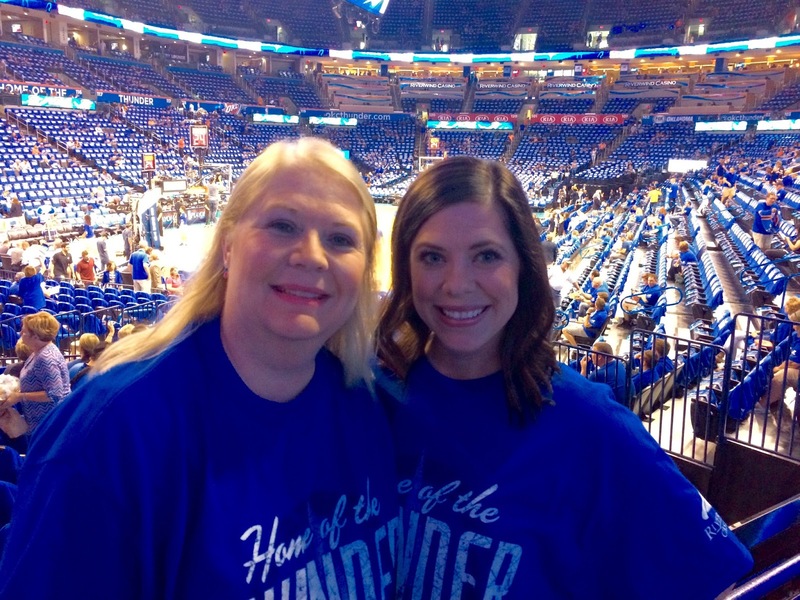 I am lucky, my parents have had season tickets since the very first Okc game!! Which by the way was o much fun! Anyhoo…. so when I knew I was going home Dad excitedly informed me I would be home for a playoff game! Yahoo!! Playoffs are like nothing else and it’s not just because you get free shirts, ha! But this was a special game this was the game we closed out Round 1 beating the Mavs!!! The energy is like nothing else! My whole family fell in love with the NBA when I danced for The Hornets and that love has never stopped! I LOVE going to games and going with Mom and Dad… thats my favorite! This was the perfect way to end my quick trip home to OKC!! Thunder UP! 🙂 I will cheer them on; if it can bring y'all a trip home together! Start of that Summer Bucket List.